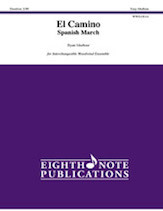 El Camino (The Road) is a Spanish march composed in the traditional style of a pasodoble. This piece is fast paced and energetic from start to finish and sounds more complicated than it seems! This is something a little different in the march category that will have audiences tapping their toes.